St. Benignus was the son of Sesenen, and Irisish chieftain. He was baptized into the Catholic faith by St. Patrick, and became his favorite disciple and his coadjutor in the Diocese of Armagh around 450. He had a gentle and lovable disposition, and was named Benen, but it was latinised as Benignus. He followed St. Patrick in all his travels, and helped him with his missionary work, especially assisting him in the formation of Choir services. From his musical acquirements he was known as “Patrick’s Psalm Singer”. St. Benignus is said not only to have assisted in compiling the great Irish code of Laws, but also that he contributed materials for the “Psalter of Cashel”, and the “Book of Rights”. He was present at the synod, which passed the canon recognizing the “See of the Apostle Peter” as the final court of appeal in difficult cases; this canon is to be found in the Book of Armagh. In Cavan, he established a monastery in today’s Drumbannon, and also in today’s Kilbonane. In Easter of 433, St. Patrick clashed with King Laoghaire at Tara over Religion, and legend has it that a trial by fire was proposed. A Pagan and St. Benignus were tied inside a burning timber building; the Pagan was reduced to ash while St. Benignus was untouched. At this point, Christian teaching was established throughout the region. St. Benignus resigned his coadjutorship in 467, and died at the end of that same year. 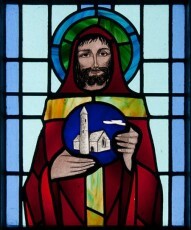 St. Benignus was a close friend and disciple of St. Patrick. He was his coadjutor Bishop, and helped him to catechize the region. He assisted in compiling the great Irish code of Laws, and was present at the synod, which passed the canon recognizing the “See of the Apostle Peter”. His loyalty to our Church was unwavering, even going through a “Trial by Fire” where he and a pagan were tied inside a burning timber building; the pagan perished and he was untouched. This won for him the honor to prove that religion was the right way to go for their country, and he and St. Patrick converted the entire region.